What is the purpose of Boarding Points on Indian railways tickets? In most of the world, if you want to travel from A to B, you buy a ticket from A to B and that's it. What is a boarding point? You can choose a boarding point, from where you will board the train. This can be any station between the Reservation From station and Reservation Upto station. By default, you Reservation From station is also your boarding point. The question left unanswered is why would you want to do this? It would seem much more logical and cheaper to just buy a ticket from Kota Jn to New Delhi. You can change boarding point any time you like after booking the ticket, so that you don't have to cancel the ticket and buy another. Railway will cancel your ticket if they can't find you in a fixed number of stops and will assign your reserved seat to a person who boarded the train with waiting list ticket. Recently I found this Boarding point feature very useful. I was booking ticket in Rajdhani from A to B but it was giving me error "BOOKING NOT ALLOWED FOR GIVEN PAIR OF STATIONS". The reason for this error is "If you're trying to book a ticket for a short journey on a train that travels a long distance, you might encounter this error message." So I booked ticket from X(Source station which is just two station before A) to B and changed my boarding to A.
Indian trains cover very large distances over multiple days and have various stoppages along the way. The reservations are usually done at least 2-3 months in advance and for this reason, having a little bit of flexibility in case of change of plans is very useful and convenient for the people. Instead of canceling the entire ticket and trying to re-book it from a new station along the way, it becomes handy to just change the boarding point while still having a confirmed ticket in hand. It might surprise some but the volume of people that travel in Indian trains every day is so huge that some people do not get confirmed seats even if they book well in advance. The ticketing system is very advanced and is designed based on the traffic which means that if X-B is a more popular travel route, more percent of seats will be allotted for this route on a particular train than A-B. It is referred to as quota but it is just based on traffic. Any tickets being booked from X-B will have more probability of a confirmed reservation than A-B. For this reason, people sometimes knowingly book tickets from a different station even if it costs more. Also, the entire reservation system is transparent so at the time of booking, you can very well see if there are seats left on A-B route or not and then book from X-B in case the seats are taken. You can still get a wait-list ticket for A-B but that will be a risk because then your confirmation will depend on somebody else canceling their A-B tickets for more seats to open up. In Indian Railways there is a system called Reservation Against Cancellation or RAC. 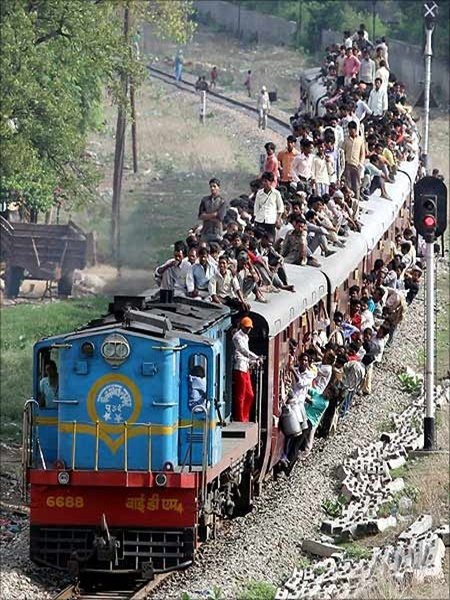 This is, let us say there are 700 seats in a train, then 750 people can book the ticket and board that particular train. A few seats (one per compartment) will be given to two people instead of one. So basically two people are alotted to the same seat. Now let us say someone did not board the train. Then the conductor will allocate that seat to one of the person who is under RAC. Now let us say, you booked a ticket from Mumbai, and decided to boared from Kota; the problem now is, when the conductor comes, you have not boarded from Mumbai and your seat will be allocated to the guy under RAC. To prevent this from happening you have to change your boarding point to Kota, so that the conductor knows that you didn't miss the train but will instead board from Kota, and your seat won't be allocated to someone else. Logically, there are more chances of getting a confirmed ticket for the route A-B than X-B. Indian Railways sells a lot more tickets than the number of seats on the train, so the ticket you buy can be in Confirmed,RAC or Waiting status. RAC - Your ticket would be in RAC if all the seats have been sold off. This mean you can get into the train and sit in some seat assigned by the TC, but you would only get a bed if someone with a confirmed seat cancels their ticket or fails to turn up in the train at their boarding point. Waiting List - This means all the Confirmed and RAC tickets have been completed and you are on a wait-list. You are not allowed to board the train with a ticket in this status. Your status might change daily until the day of departure depending on the number of Confimred/RAC passengers cancelling their tickets. I want to have a better probability of getting a Confirmed ticket rather than a RAC/Wait-listed ticket and I don't mind the extra charge I pay for my lesser distance. If I just buy a ticket from A-B without specifying any boarding point and try to board at X, I would be marked as a no-show and my seat would've already be given to some RAC passenger. So the proper procedure of booking would be to buy a ticket for A-B with boarding point as X. This makes sure I have my seat and bed free when I board in station X.
I had originally intended to travel from A-B, but later changed my plans and want to board the train at X. If I cancel the whole ticket and try to buy a new ticket for X-B, I might get a Wait-listed ticket. Hence, I keep my existing Confirmed ticket and just change the Boarding point to X. Not the answer you're looking for? Browse other questions tagged trains tickets india irctc or ask your own question. Can I board my train from booking point which is one station before my boarding point? How can you buy train tickets at Oslo Airport? Can I board the train before the specified boarding point if I have a reservation? How does Indian Railways allot seats in case of change in boarding point?